They say that a picture can be worth a 1000 words, and that’s sometimes true when it comes to identifying a part that you need for your vehicle. The part is in front of you, but you may not be quite sure of the terminology to describe it, or sometimes we all use different terms to describe the same item. You can use this service for parts for Whale vehicles as well as vehicles from other manufacturers. The Parts Identification Service is just one of the ways the Whale Parts team can help you keep your vehicle running and maximise its operating hours. Whale Tankers Ltd keeps all records of vehicles that have been built, so that we can identify what was originally supplied on the vehicle when it left Whale. 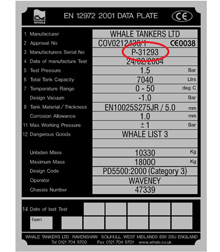 Whale parts team will always ask for the 'P' number of the vehicle so that we can locate the bill of materials (BOM). 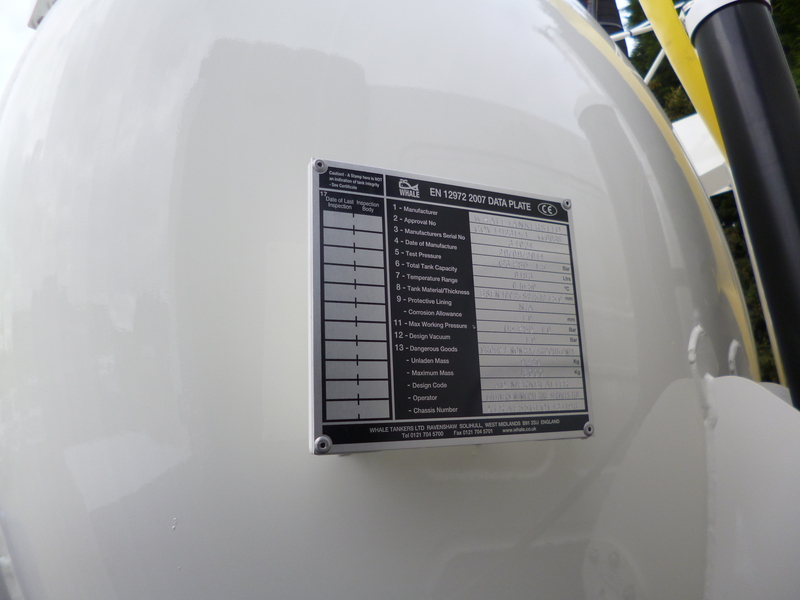 Every vehicle will have or should have a tank data plate displaying the manufacturers serial number (P number). The tank data plate will be found near the front of the vehicles bodywork and will display the tanks original design data. At the bottom of the plate are spaces for date stamps, a record of each time the tank has been inspected and fitness tested by a Whale Engineer. The Information Displayed In The Image Is A Typical Example And Should Not Be Quoted In Relation To Your Vehicle.